Grand Duke Henri is currently in Azerbaijan where he attended the opening ceremony of the first European Games in country's capital Baku last night. The Grand Duke already travelled to Azerbaijan on Thursday and attended an official dinner with some rather interesting people. 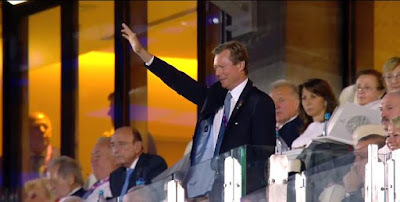 (To be honest with you, during events like this, I always wonder whether it's a good idea for a Western head of state to be a member of the IOC...) Grand Duke Henri will stay there until Sunday to cheer on the 18 Luxembourgish athletes during the competitions. He is accompanied to Azerbaijan by the Minister of Sports Romain Schneider. For a video of the opening ceremony, have a look at Youtube. Simply skip ahead to the 57 minute-mark to see the Grand Duke.